What's the meaning of the phrase 'Genius is one percent inspiration, ninety-nine percent perspiration'? Genius is largely the result of hard work, rather than an inspired flash of insight. What's the origin of the phrase 'Genius is one percent inspiration, ninety-nine percent perspiration'? Few proverbial sayings can be attributed to a named individual. In this case, we can name the coiner of the expression - the American inventor Thomas Alva Edison. 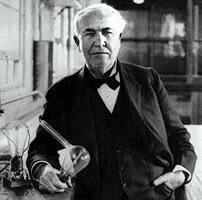 Edison is first reported as saying "Genius is one per cent inspiration, ninety-nine per cent perspiration" sometime around 1902, in the September 1932 edition of Harper's Monthly Magazine. It is impossible to know at this remove whether the Harper's journalists were accurate in their attribution, although no one else appears to have uttered the words before they reported them in 1932. 'Genius' (which means transcendent capacity of taking trouble, first of all). I know of no genius but the genius of hard work.